Sorry, we're all booked up! Check back for more classes to be added soon! We are now taking reservations for 2018 for our Mobile Training Classes! Logan Haus Kennels is now equipped to bring our 3-day, 4-day, and 5-day seminars to you! With our self-contained mobile classroom, we are able to teach our Puppy Imprinting & Development Course, Detection Fundamentals Course, and our Canine Trainers Course at your facility. (Please refer to each course's individual page for course descriptions.) Every piece of equipment has been specially designed for easy travel and setup and completely duplicates the equipment used in our normal classes at our own facility. Along with the equipment, we also bring along our chickens and puppies (when available) to be used as training models for the students. This ensures your class will exactly mimic our classes at our own facility. 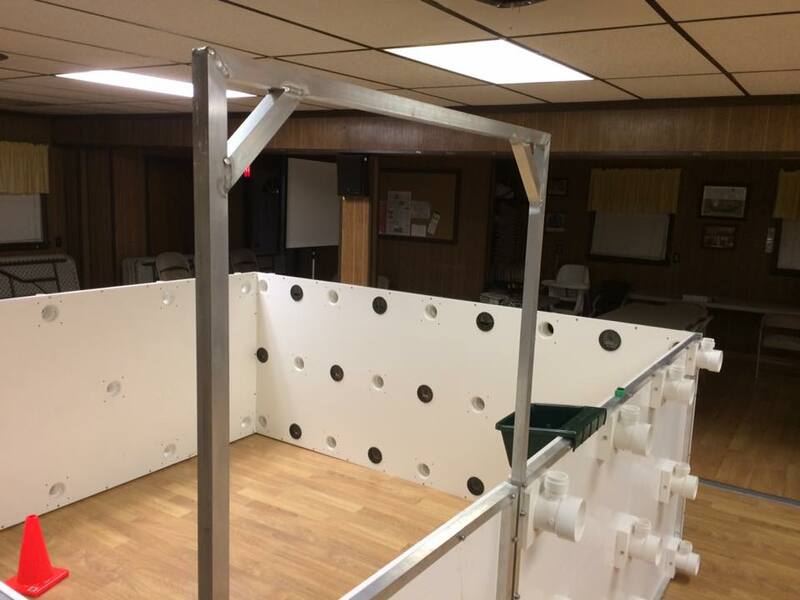 Mobile Scent Detection Room: This 10'x10' room is used for training odor detection using either a food reward or toy reward system. The room also serves as a small training room totally free of any distractions for training and shaping behaviors with puppies and adult dogs. Skinner Box: This small, elevated box is used for early imprinting in detection work with our puppy scent tubes. 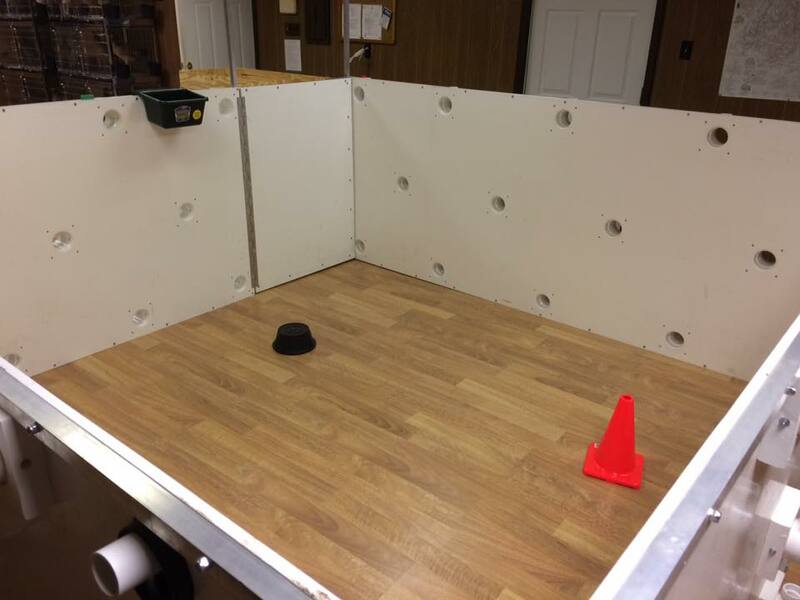 This box is also sometimes used for shaping behaviors with young puppies. Scent Tubes: These tubes are a vital part of our odor imprinting program and are used extensively in both of the offered courses. We will also have these kits available to purchase. 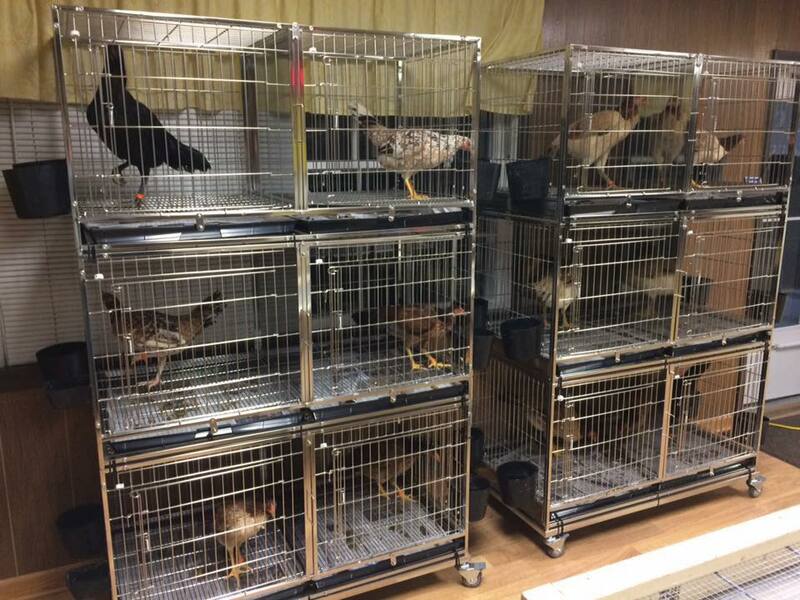 Chickens: Due to their fast movements and flighty nature, chickens make an excellent training model to help students work on their timing and practice shaping behaviors. 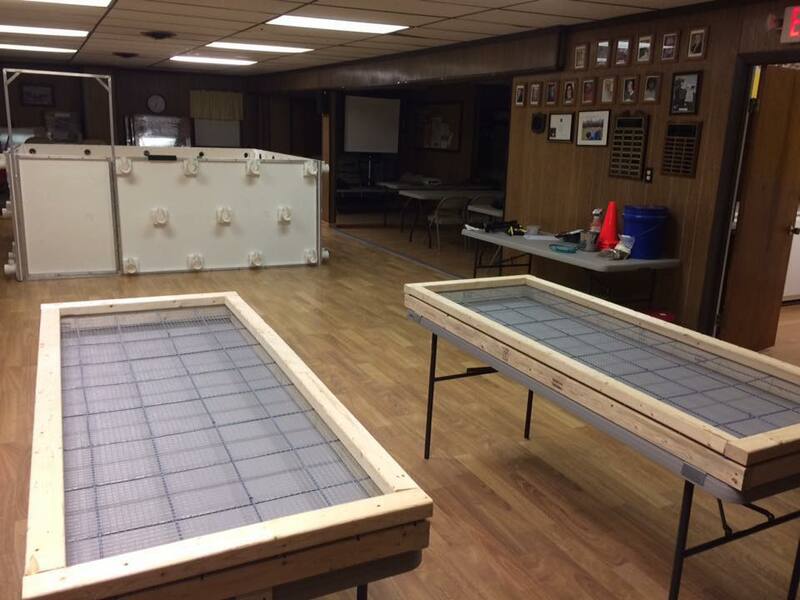 Chicken Training Tables: These specially designed tables maximize the effectiveness and efficiency of the training done with the chickens. Puppies (when available): While we would prefer to use puppies you provide for our mobile classes, we are sometimes able to bring a limited number of puppies with us. When traveling with our own dogs, if there is no kennel space available on site, we bring our own kennel system for housing them while at your location. Classroom: We need an area large enough and with enough chairs and tables for all participants to sit comfortably. Ideally, this room would have a television for us to show our Power Point during the lectures; if a television is not available, we do bring our own projector with us. Amenities: The facility must have a bathroom and the host is responsible for water, snack, etc. 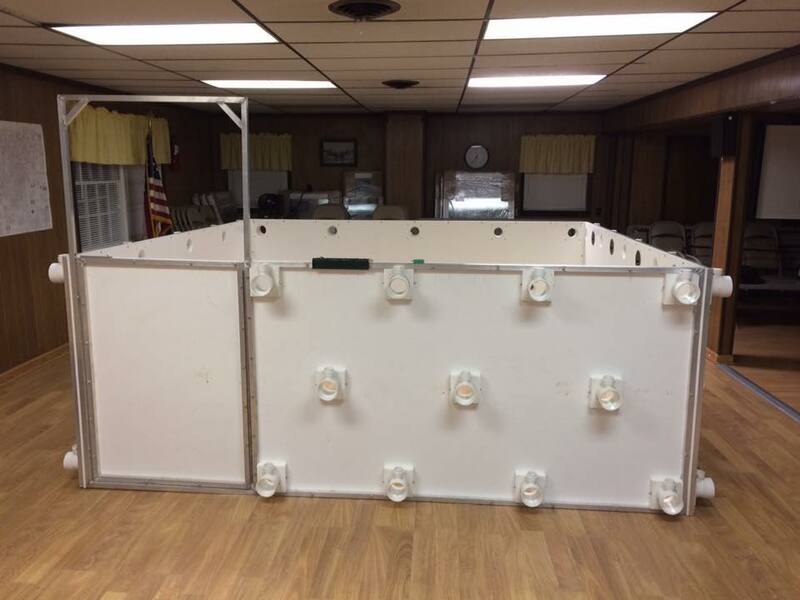 Indoor Training Area: We need an indoor area totaling roughly 30'x40' in which we can wet up our 12'x12' mobile detection room, two 2'x4' chicken cages along with two 2'x6' chicken training tables. The more room the better, but we can make due as long as there is enough room for the things listed here. Parking Area : We need to be able to pull in, unload, and turn around a 50' long vehicle/trailer. 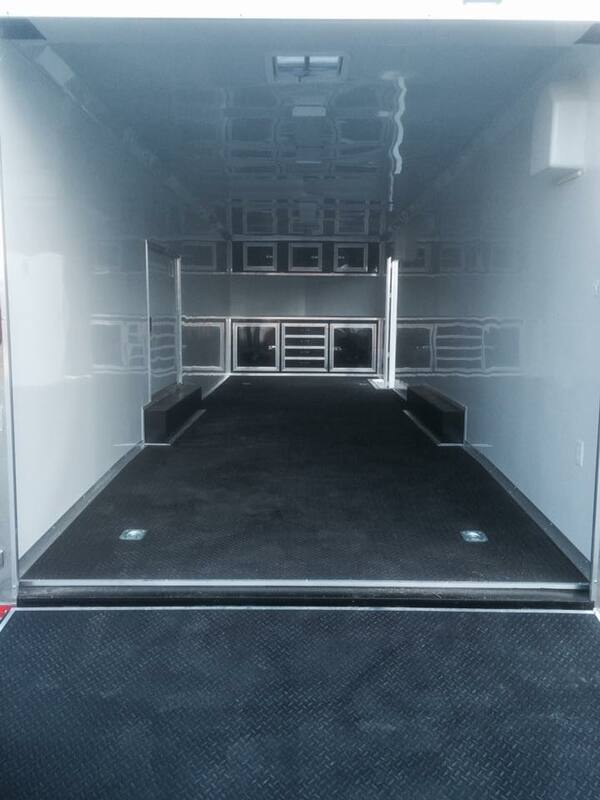 There will need to be a place close to the indoor training area and classroom for us to park the trailer. 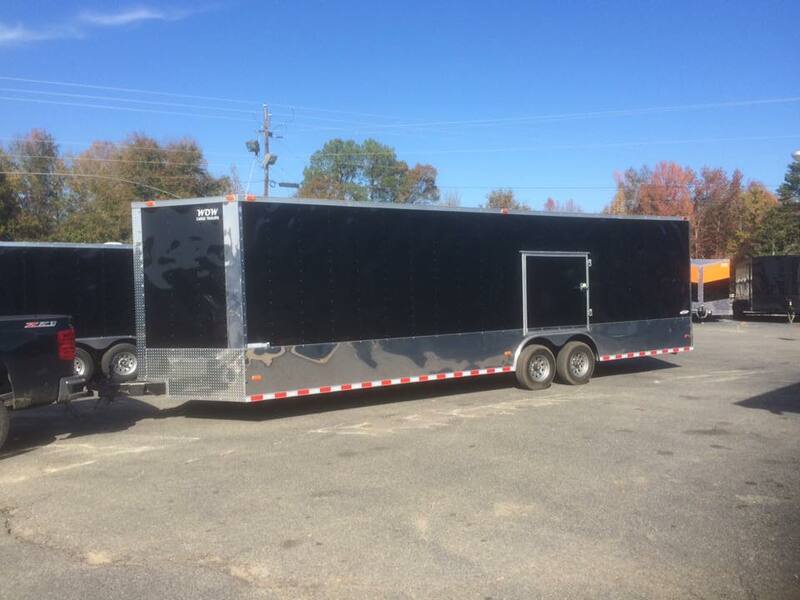 We will need to leave the trailer at the seminar location and we will need access to a standard electrical outlet. Puppies: If you or someone you know has a litter of 5-12 week old puppies, we can use them as training models during the class. 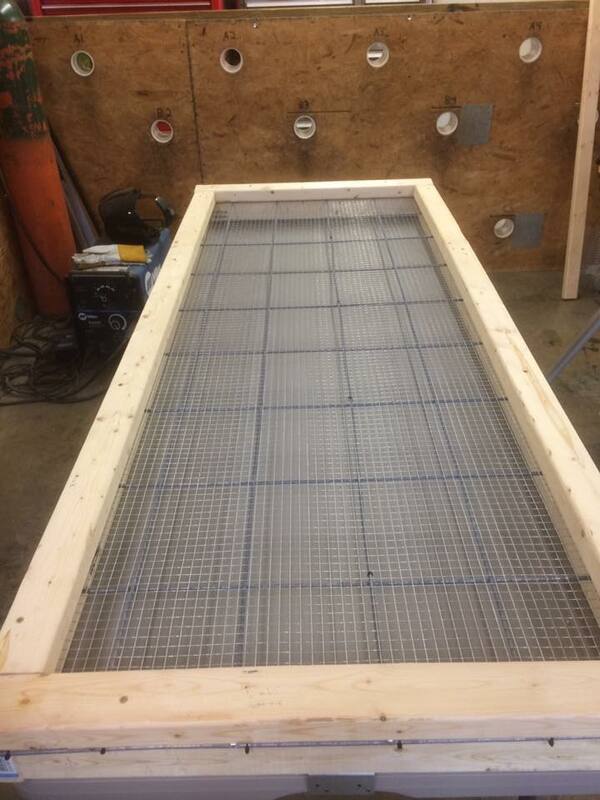 We have a 4'x8' indoor and 10'x10' covered outdoor kennel system to safely house the puppies during the class. The cost for the class is $1000 per day. We allow 10 working spots and unlimited audit spots - you choose the pricing. We will add your class to our website calendar and list of courses. We will create a Facebook event page and help you promote your class. Certificates will be issued on the last day of class. Please contact us today to set up a class at your location! If you are interested in booking a private seminar with your club/SAR team/training group, please contact us. We are happy to customize a seminar tailored to your training needs either here at our facility or at yours!